Home / Blog / Yongin, South Korea, Shut down the illegal dog meat farms, slaughterhouses and markets. In Yongin, there are countless dog farms, slaughterhouses, markets and restaurants where the dogs, who are tortured their entire lives, end up being slaughtered in the most inhumane ways, such as by electrocution, hanging or beating; and then thrown into boiling water – sometimes while they are still alive. In many places, dogs are being killed in full view of other terrified, caged dogs; and this takes place in broad daylight. In addition, many abandoned and stolen former pets end up in this industry, and are subjected to the same cruelty. Video: Dog meat industry protesting to keep their vile industry going and the animal rights activists fighting back in Seoul, Korea. Coexistence of Animal Rights on Earth(CARE). The searches resulted in: 292 Health Food Shops; and 190 restaurants in and around Yongin. Even if half of these ‘Health’ Food Shops and restaurants serve dog and cat ‘ingredients’ in one form or another, just imagine how many dog/cat slaughterhouses must be present in and around Yongin in order to supply all of these outlets. Please sign petition, call, write and email the Yongin Mayor and the City Council TODAY! Subject: Yongin, South Korea, Shut down the illegal dog meat farms, slaughterhouses and markets. 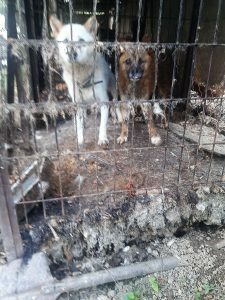 Petition: Yongin, South Korea, Shut down the illegal dog meat farms, slaughterhouses and markets. Please everyone complete as many actions as you can to #SaveKoreanDogs from a living Hell ! Incohérence de ce pays, ils rendent honneur à un chien soldat mort en mission! et mangent ses congénères . Ils sont bien contents en période de catastrophe d’avoir l’aide de ces braves chiens!!!! Des fourbes!!!! !